It’s a LOT of work trying to resuscitate a blog when you’ve allowed time to pass without posting anything. I am so excited about my upcoming trip to Germany, though, and am doing some fabulous prep work to get ready for it. I wanted to be sure to document everything. In my work, I’ve paid close attention to the materials with which I work. I was trained to work with foam, but the truth is that I hate foam rubber. Sure, it can do amazing things, but the environmental impact has always bothered me. Also, if you’ve ever worked with foam, then you know how annoying those little bits of foam that you’ve shave off get all over your clothes, your house…just everywhere! About eight years ago, I started playing around with wool. I fell in love with this material and with the process of wet-felting. Now, the word “felt” conjures up some images that are more akin to kindergarten craft projects rather than art worth looking again, but think again! Wet-felting is one of the most ancient practices for creating textiles. It’s a process that, in contemporary times, involves bubble wrap, olive oil soap, warm water, bamboo mats, pantyhose, and pool noodles. Really. Rabbit mask by Gladys Paulus. Made using wool. Just wool! 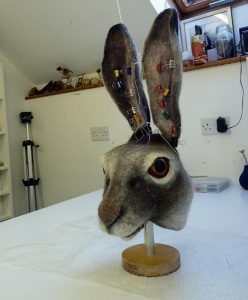 This rabbit is a work-in-progress, but a quick Google of “Gladys Paulus” with images will pull up a host of photos (it’s a fun rabbit hole to dive down) or you can check out her website and look at her gallery. In advance of my trip to Deutschland, I am brushing up on my German (I did a language immersion back in 1993…that was a while ago!) and also doing experiments and studies on surface texture/design. I will be documenting my progress and personal studies on this blog to have a record of what I have learned. The two workshops in Germany will be creating seedpods and a mask workshop. Both focus on wet-felting around a resist. The works are fully wet-felted, no sewing to connect parts — just wet-felting! I’m excited and trying to figure out how I am going to handle the materials list (it’s pretty extensive) with my regular luggage. I do need clothes, I guess? Right?